A sitter to start off the week… Which famous experiment is depicted here? Cracked by Tathagata Chatterjee , sidsen , Dibyo , Rohan , Goyal , insufferablejake , piezocake , Guneet , Vinay , Ananth , VikraM , Sujay , gudanggurum (copy-pasta is not required, mate), Atul Mathew , Nakul , Chandrakant Nair , malcaluffin , duriel , rajeshvj and Prasad; or, in short, almost everyone. 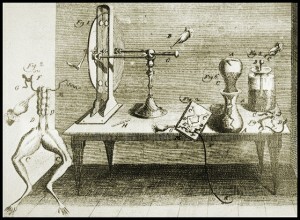 Luigi Galvani’s famous frog’s leg experiment. 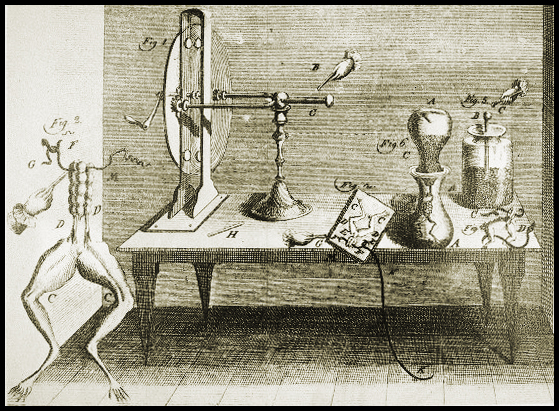 Galvanism: The Luigi Galvani’s experiment on a dissected frog, that proved electric energy is responsible for muscle movement. Luigi Galvani’s dead frog’s leg. Graham Bell’s tuning fork Experiment? Luigi Galvani\’s experiments with static electricity. In 1783, according to popular version of the story, Galvani dissected a frog at a table where he had been conducting experiments with static electricity, Galvani’s assistant touched an exposed sciatic nerve of the frog with a metal scalpel, which had picked up a charge. At that moment, they saw sparks in an electricity machine and the dead frog’s leg kick as if in life. The observation made Galvani the first investigator to appreciate the relationship between electricity and animation — or life. This finding provided the basis for the current understanding that electrical energy (carried by ions), and not air or fluid as in earlier balloonist theories, is the impetus behind muscle movement. He is poorly credited with the discovery of bioelectricity. The Animal electricity experiment by Galvani. Was no way a sitter for me :)). Spent considerable time googling with all the wrong keywords. Luigi Galvani’s experiment with the famous twitching frog legs and static electricity.